Shiron Hagens of St. Louis registers voters at a rally in Ferguson, Missouri, in August. Update (Oct. 7, 4:38 p.m.): On Tuesday, the St. Louis County Election Board said it had incorrectly reported that 3,287 people in Ferguson, Missouri, had registered to vote since early August. The actual number of new registrants from Aug. 9 to Oct. 6 totaled just 128. Read more here. Following the fatal shooting of Michael Brown in Ferguson, Missouri, community leaders started registering people to vote — an effort, in part, to remedy the racial disparity between the township’s government and population. Ferguson is 67 percent African-American, but five of its six City Council members are white. So is the mayor. Ferguson holds most of its elections in non-presidential years, and always in April, timing that typically leads to less minority turnout. In the 2013 election, the most recent municipal election for which racial data is available, whites made up 52 percent of voters in Ferguson. But the recent registration efforts may reduce this gap. According to the St. Louis County Board of Election Commissioners, 3,287 new voters have registered in Ferguson since Brown was killed. As Yamiche Alcindor of USA Today pointed out, the county registered 4,839 new voters — in total. Those numbers might not seem that big, but in a midterm election year, that’s an amazing number of new voters for a city the size of Ferguson. And the percentage of newly registered voters in Ferguson compared to the county as a whole (68 percent) is equally staggering. Since 2002, the township of Ferguson’s new voters have made up no greater than 3.6 percent of new registrants in St. Louis County overall. 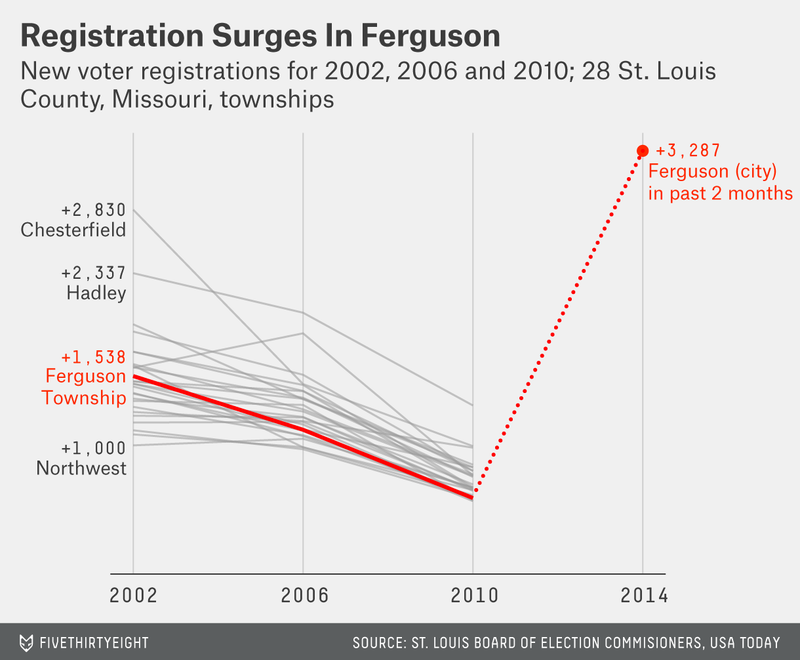 In other words, Brown’s death has spurred a lot of people in Ferguson to register to vote. One quick note: The historical data I’m using here is for townships, not municipalities. The vast majority of the city of Ferguson (where those 3,287 new voters are located) is in the township of Ferguson (a county subdivision), but the township has about double the number of registered voters as the municipality. That makes the following numbers even more impressive. In midterm election years dating to 2002, the township of Ferguson has never registered more than 1,538 new voters. And the average number of voters added to the rolls across the past three midterm years is just over 1,000. Those numbers are for the entire election cycle. The number of new registrants in the city of Ferguson over the past two months is more than double the highest number (and more than than triple the average) in the township of Ferguson in midterm election years since 2002. The city of Ferguson’s 3,287 new registrants (in two months) is more than recorded by any township in St. Louis County in any midterm election since 2002. The previous midterm-year high, 2,830, belonged to Chesterfield. These newly registered voters could easily shake up municipal elections. In the 2014 mayoral election, the winning candidate, James Knowles III, was unopposed and won with just 1,314 votes. In the most recent competitive mayoral election, in 2011, Knowles won by just 511 votes. The total number of voters in that election was 2,265. The City Council elections tell the same story. In council elections in the three city wards over the past five years (each ward elects two council members), no candidate has won more than 650 votes. The most total votes cast in any of these elections is 1,085. The average number of votes cast in council elections since 2009 has been just 490. The newly registered 3,287 voters won’t be able to vote in all these ward elections, but even dividing this number by three (the number of city wards) leaves us with more than 1,000 voters. The new registrants, if they voted in anything resembling a bloc, could sway the outcome in a large number of these elections. Also of note, in five of these 12 elections, the winning candidate ran unopposed. The new registrants could spur competition and invite a new slate of candidates to run for office. It may be a whole new game in Ferguson’s elections — as long as people vote.